Mice seem to appear out of nowhere. 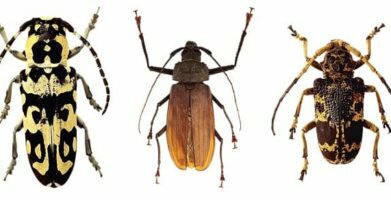 They are fast and can scurry up a wall or across the room in seconds. 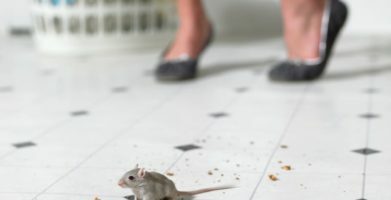 It is hard to implement pest control for mice because they are so quick and crafty. 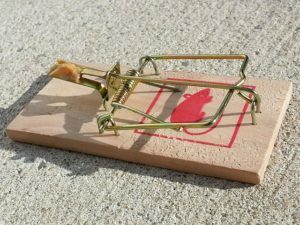 Traps are commonly used for pest control. Spring traps leave you with the problem of having to dispose of dead mice. Mice carry diseases and parasites. Every time you handle a dead mouse, even though you are careful and take precautions, you could be exposed to these diseases and parasites. Glue traps capture mice but do not harm them. Your problem will be to have to kill the mice that are caught on the glue traps. An alternative is to take the live mice somewhere else far away to prevent them from coming back. Transferring mice to another location puts you at risk of contracting diseases and parasites that they are carrying. 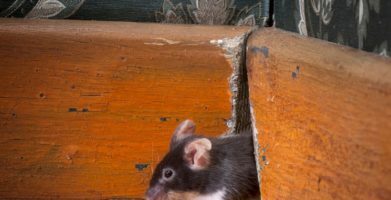 If there is an opening, a crack, or hole in a building, recreational vehicle, car, truck, or farm equipment cab, mice can probably find their way in. Mice can fit through spaces only slightly bigger than 1/4″ in diameter. This leaves your house, business, equipment, or vehicles susceptible to mice. It doesn’t matter if the 1/4″ opening is so high that it’s out of your reach. Mice can climb walls made of just about any material. With a running start, they can leap distances of over one yard, and they can jump up to surfaces one foot high. Mice can get into places you never thought they could get into. Fresh Cab® is a better method of pest control for mice. 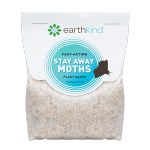 It has been evaluated and registered by the Environmental Protection Agency (EPA) as a safe and effective way to get rid of mice when used as directed. Fresh Cab is the only plant-based rodent repellent on the market today that has the approval of the EPA. There are no safety warnings for Fresh Cab because there are no known hazards of using this product. When used as directed, Fresh Cab does not present any health or safety risks to humans, animals, or the environment. You will not need to worry about small children or pets finding the Fresh Cab pouches, because the ingredients are harmless to humans and animals. There are no messy traps to clean up and no dead mice to dispose of. The mice simply leave any area with Fresh Cab pouches placed around it. Fresh Cab is made of botanical ingredients. Balsam fir needle essential oil is the active ingredient, and the remainder of the patented formulation is made of plant cellulose fiber from corn cob chips and additional essential oils. The fragrance of Fresh Cab is pleasing to humans, but it signals mice to avoid the area. When mice pick up the scent of Fresh Cab, they find another place to hide or live. Fresh Cab is guaranteed to get rid of mice and other rodents. 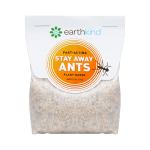 It is the most reliable and the easiest pest control for mice available today. If there is an opening, a crack, or hole in a building, recreational vehicle, car, truck, or farm equipment cab, mice can probably find their way in. Mice can fit through spaces only slightly bigger than 1/4" in diameter. This leaves your house, business, equipment, or vehicles susceptible to mice. It doesn’t matter if the 1/4" opening is so high that it’s out of your reach. Mice can climb walls made of just about any material. With a running start, they can leap distances of over one yard, and they can jump up to surfaces one foot high. Mice can get into places you never thought they could get into. The fragrance of Fresh Cab is pleasing to humans, but it signals mice to avoid the area. When mice pick up the scent of Fresh Cab, they find another place to hide or live. Fresh Cab is guaranteed to get rid of mice and other rodents. 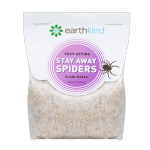 It is the most reliable and the easiest pest control for mice available today. string(21) "Pest Control for Mice"